A Beam is a line structural that carries load primarily in bending. Beams are characterized by their profile (the shape of their cross - section), their length and their material. 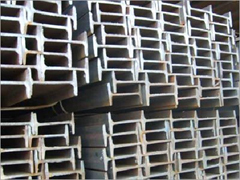 One of the most common types of steel beam is the I-Beam or Wide- flange Beam. A visibly sagging beam, through structurally safe, is unsightly and to be avoided. A stiffer beam produces less deflection Beam Provide economical floor and roof systems in applications requiring longclear spans and lighter weight systems. The major applications are Bridges,Flyovers, Pedestrians Walk Overs and Buildings.